Since its debut in 1997, Google Search in general has grown in size and strength. Since then, the keyboard and mouse have always been a primary tool in searches. In 2008, the Google Mobile App was released to the Android and iOS operating systems, allowing native and mobile searching of the web. A few months later, they integrated a new feature that they had been working on into the mobile apps called Voice Search. Voice search was a new idea on how to revolutionize searching. But most Google searches were done on the computer, so even if everyone used voice search on their phones, more requests would be made from a keyboard. Google took a surprising 2½ years to make their next move. 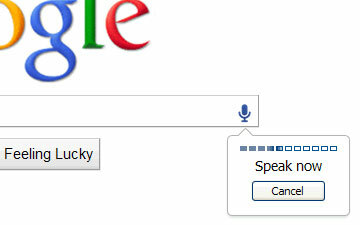 Then about a month ago, they released Voice Search online, using the same microphone input as Gmail chat. However, they confined it the Chrome as an experimental search feature. I think that Google really has enough “innovations” that they’ve given to us and that using a keyboard is just fine for searches. Personally, I talk faster than I type, but I am so used to typing that a switch to talking instead is actually harder, at least for a while. I see where they are going with the user-friendly ideas, but this is one of their kind of unnecessary ones. The recognition accuracy is ok, but as I expected it doesn’t work well with names, even of well-known people. If you want to try it out, head on over here in Google Chrome and hit Try It Out. This entry was posted in Freeware, Personal, Review, Thoughts, Web and tagged Android, Google, ios, iPhone, Search, Voice, Web by Joby Nadel. Bookmark the permalink.